The MACD indicator is basically a refinement of the two moving averages system and measures the distance between the two moving average lines. MACD is an acronym for Moving Average Convergence Divergence and was introduced by Gerald Appel in his book, The Moving Average Convergence Divergence Trading Method. The MACD indicator is primarily used to trade trends and should not be used in a ranging market. Regular signals are taken when MACD crosses its signal line, normally calculated as a 9-day exponential moving average of MACD. First check whether price is trending. If the MACD indicator is flat or stays close to the zero line, the market is ranging and signals are unreliable. Go long when MACD crosses its signal line from below. Go short when MACD crosses its signal line from above. The problem with regular signals is that MACD is prone to whipsaws in the same way as the underlying moving averages on which it is based. a divergence on the MACD indicator. Use MACD Percentage Price Oscillator in order to consistently identify large swings. MACD Percentage is a variation of the MACD indicator that uses a percentage scale, enabling comparison between stocks at different prices. 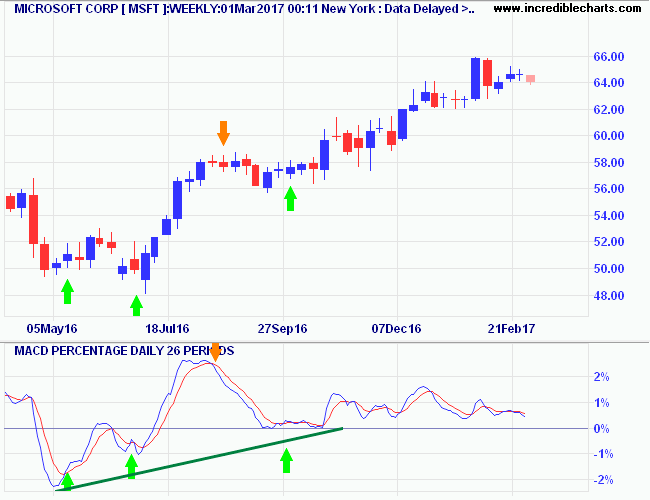 Microsoft Corporation weekly chart is plotted below with 26-day MACD Percentage and 9-day signal line. Swings above 2% or below -2% are traded as large swings. Divergences, where a second, smaller swing reverses below the 2% band, are also traded as strong signals. Green arrows signal Long trades and Orange arrows indicate Exits. Only long trades are taken as MSFT has clearly been in an up-trend since early 2013. Go Long when MACD crosses above the signal line after a large (< -2%) swing. Exit when MACD reverses below the signal line after an opposite large swing > 2%. The next swing below zero is ignored as it does not reach -2%. Go Long on the next large swing < -2% in early May 2016. Ignore the next crossover close to the zero line. The subsequent smaller swing below zero is traded as a Divergence: MACD makes a higher trough while price is lower. Exit on the next large swing above 2%. The later Microsoft chart below displays a strong up-trend that developed in late 2016. The exit from August 2016 (#7 above) is the orange arrow in the middle of the chart. There is only one new entry on this chart but an important one. The trough above zero, at the end of September 2016, flags a strong up-trend and we go Long in anticipation. Subsequent crossovers above the zero line are ignored as they are below the 2% threshold. It would be a mistake to treat one as a bearish divergence. 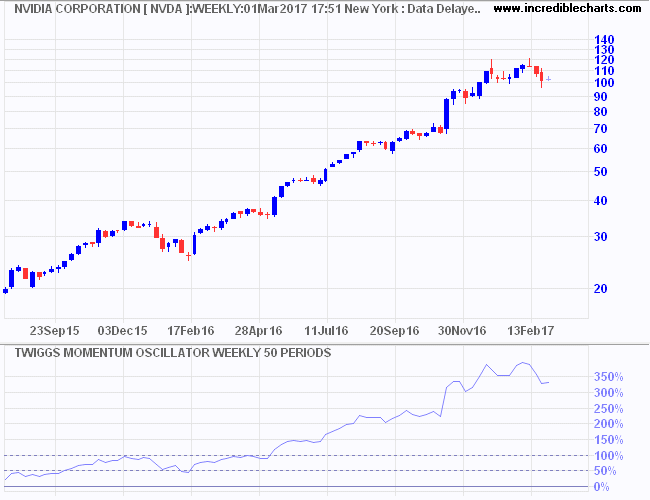 MACD oscillating above the zero line reflects a strong up-trend. Oscillation below zero would likewise reflect a strong down-trend. 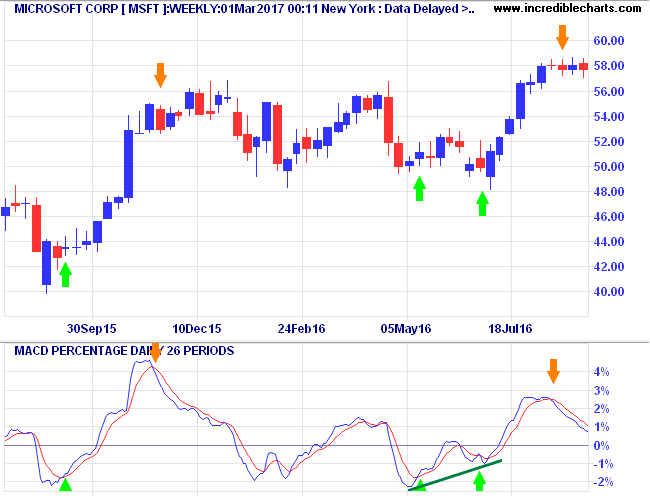 MACD Divergences are suitable for trading trending stocks that undergo regular corrections. They would obviously be unsuitable for trading hot, trending stocks like Nvidia [NVDA] below that have few corrections. I would not trade high momentum stocks like Nvidia with MACD crossovers, even Divergences and/or large swings. Instead I would revert to a simple two-moving average system, only trading crosses above/below the zero line. 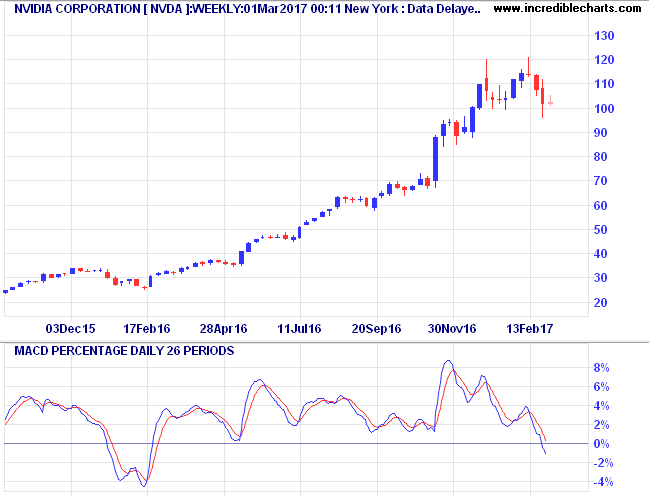 Go Long when MACD (or MACD Percentage) crosses to above zero. Exit, or go short in a long-term down-trend, when MACD crosses to below zero. Use long-term momentum, like 50-week Twiggs Momentum in the example below, to identify strong trending stocks like NVDA. There is a gray area with values between 50% and 100% (Microsoft peaks around 40%) but anything over 100% is a clear warning to adapt your trading system. Signal line: 9-day moving average of the difference between fast and slow. All moving averages are exponential. See Indicator Panel for directions on how to set up an indicator. See Edit Indicator Settings to change the settings. 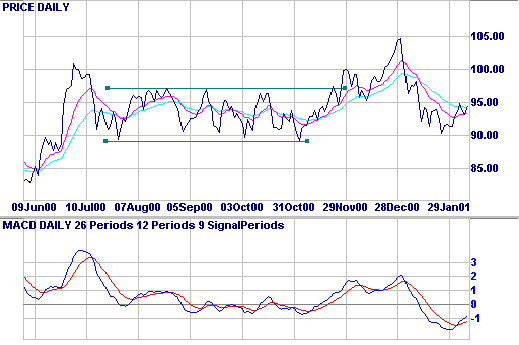 The signal line is calculated as a 9-day exponential moving average of MACD. Johnson & Johnson with a 12-day , and a 26-day exponential moving average (EMA) plotted on the price chart. MACD reflects the difference between the fast and slow EMA. The signal line is a 9-day EMA of the MACD indicator. MACD is furthest from the zero line when the gap between the two EMAs is widest. MACD is at zero when the two EMAs cross (the trading signal when using two moving averages). MACD fluctuates between 1.0 and -1.0 when the market is ranging. You will find more on MACD Percentage Price Oscillator at this link. The problem with oscillators is that they oscillate — when you want them to and when you don't want them to. By trading large swings and divergences you reduce the chance of whipsaws from minor fluctuations. Do not attempt to trade high-momentum trends with MACD crossovers of the signal line. Rather opt for simple crossovers above/below zero. MACD Percentage MACD Percentage Price Oscillator is a variation of theMACD indicator. The major difference is the percentage scale which enables comparison between stocks. MACD Histogram The MACD Histogram (Moving Average Convergence Divergence Histogram) provides far earlier and more responsive signals than the original MACD, but is also more volatile. Weekly MACD Histogram The MACD Histogram (Moving Average Convergence Divergence Histogram) provides a highly responsive measure of market direction but is more suited to traders than investors.